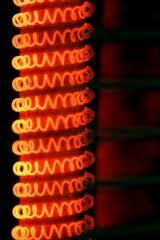 Infrared heaters are safer and save money in energy costs. Dr Infrared DR968 does all that in a stylish wooden container with no exposed heating elements that can cause burns. The space heater has a high, low, and auto mode setting that saves energy. This small space heater from Vornado is powerful and feature laden. Heating an entire room becomes a worry of the past since it is designed for a 16×16 room with an 8 foot ceiling. The TVH500 comes with a remote, shutoff features, a handle for easy portability, and three different fan speeds. The Lasko Ceramic Tower Heater comes with a remote control for added usefulness. The unit is very quiet during operation and also has an 8-hour timer so you can leave it alone and know it will turn off. Oil-filled radiators are great at heating any room in the house. This model has a built-in thermostat to keep the room at a comfortable temperature while keeping energy consumption low. One of the biggest draws to this rugged heater is safety. It is approved for indoor and outdoor use. Said to heat up to a 200 square-foot space, the Mr.Heater will probably be your best friend in cold weather. You can get this ceramic heater for a great deal. It has an oscillating mode for even room heating, two settings, and a fan-only mode. Safety features like overheat protection, thermal cut-off, and tip-over protection add peace of mind. This heater is still in the reasonable price range, and does its job very well. Its convection heating and oscillation make this unit warm up a room quickly, and its saves energy by shutting off automatically when it reaches its target temperature. A low priced heater perfect for heating small rooms on chilly days. This ceramic heater has 3-settings, a self-regulating ceramic element, is very quiet, and utilizes an automatic overheat protection feature for safety. This unique heater is wall-mounted to an electric outlet which frees up space in your room and eliminates having another cord to trip over. Designed for small to midsize rooms, this Seabreeze heater is a great alternative to central heating in terms of cost and performance. The unit features an outlet so an entire outlet is not devoted to the heater. Although it lacks a thermostat, the Optimus H-4439 is ideal for small to mid-size rooms. This heater gives off a radiant heat, runs quietly, and oscillates. It consumes very low amounts of energy while on the low setting and has numerous automatic shut-off triggers to give you peace of mind.